MERK! 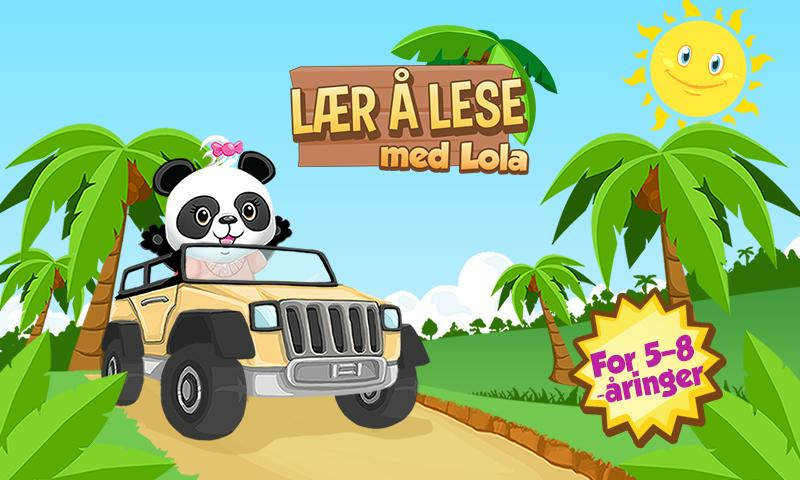 Denne appen er tilsiktet bruk sammen med LolasLærepakke.Lolas Lærepakke kan lastes ned fra Play Butikk LolaBundle AppiGode lese- og skriveferdigheter gir barn de bestemulighetene forall læring i de årene de går på skolen. Lær å lesemed Lola er dentiende Lola Panda-læringsapplikasjonen. De flesteførskolebarnsynes det er gøy å leke med ord og rim. På den måtensetter barn igang sin fonologiske bevissthet uten at de faktisk vetdet. Envelutviklet fonologisk bevissthet betyr at barn kan byttefra etord til et annet ved å legge til, trekke fra ogerstattebokstavrekker, for eksempel, hatt - ratt og natt. Lær åLese medLola har opplæringsinnhold innen 9 nivåer: * Enkelt 1: Ordmed desamme rimende endelsene, ag - dag * Enkelt 2: Lette ord meddesamme rimende endelsene, or - mor * Enkelt 3: Noenlunde enkleordmed de samme rimende endelsene, ell-skjell * Middels 1:Dagligdagseord med de samme rimende endelsene, ake - kake * Middels2: Mindrevanlige ord med de samme rimende endelsene, al - hval *Middels 3:Vriene rimende ord med endelser som passer sammen ogerforskjellige, bue - skrue - due * Vanskelig 1: Utfordrende ordmedrimende lyder, og endelser som passer sammen og erforskjellige,fjell - gjeld - kveld * Vanskelig 2: Krevende ord medrimendelyder, og endelser som passer sammen og er forskjellige,nøtt -nyfødt - kjøtt * Vanskelig 3: Vanskelige ord med rimendelyder ogendelser som passer sammen og er forskjellige, fond - sånn– blondUtmerkede lese- og skriveferdigheter gir barn de bestemulighetenefor all læring i de årene de går på skolen. Forskeremener at deter veldig viktig for den tidlige leseopplæringen atbarngjenkjenner språkets form, det vil si, evnen til å rime. Lær åLesemed Lola er perfekt for barn som synes Lolas Alfabet-tog ogLolasABC-Fest er for lette, men som ennå ikke er i stand til åleseflytende. Denne applikasjonen passer for både førskoleklasserog 1.klasse. Den kan bli brukt i grupper eller alene. Barn kanbrukeappen alene ved å begynne på det enkle nivået. Etter hvert sometbarn lærer og løser flere oppgaver, så vil appen automatiskbyttetil vanskeligere nivå. Alternativt, så kan en lærer ellerforeldervelge et passende nivå som spillet skal holde seg på. Lær åLesemed Lola er profesjonelt designet og hjelpes av brukerdatafratitalls millioner barn som allerede koser seg medLolaPanda-læringsapplikasjoner over hele verden. Vi har strebetetter ågjøre applikasjonen så gøy at barn ønsker å lære, selv om duikkeengang oppfordrer til det. Mer om høykvalitetsLolaPanda-læringsapplikasjoner kan bli funnet her:www.lolapanda.comNyt læringseventyret med Lolas rimende ord! NOTE!This app isintended for use with Lola's Learning Package. Lola'sLearningPackage can be downloaded from the Play Store Lola BundleApp indetails ISIN Good reading and writing skills give childrenthe bestopportunities for all learning in the years they attendschool.Learning to read with Lola is the tenth Lola Pandalearningapplication. Most preschoolers find it fun to play withwords andrhymes. In this way, children start their phonologicalawarenesswithout actually knowing it. A well-developedphonologicalawareness means that children can switch from one wordto anotherby adding, subtracting, and substituting letters, forexample,having - steering wheel and night. Learn to read with Lolahastraining content within 9 levels: * Single 1: Words with thesamerhyming endings, ag - day * Single 2: Light words with thesamerhyming endings, or - mor * Simple 3: Somewhat simple wordswiththe same rhyming endings, ell-shells * Medium 1: Everydaywordswith the same rhyming endings, ake - cake * Medium 2: Lesscommonwords with the same rhyming endings, al - whale * Medium3:Twisting rhyme words with endings that fit together andaredifferent, bow - screw - dove * Difficult 1: Challenging wordswithrhyming sounds, and endings that fit together and aredifferent,mountains - debt - evening * Difficult 2: Demanding wordswithrhyming sounds, and endings that fit together and aredifferent,nut - newborn - meat * Difficult 3: Difficult words withrhymingsounds and endings that fit together and are different, fund- such- blond Excellent reading and writing skills give childrenthe bestopportunities for all learning in the years they attendschool.Scientists believe it is very important for the earlyreadingeducation that children recognize the form of language, thatis,the ability to rhyme. Learning to read with Lola is perfectforchildren who think Lola's Alphabet trains and Lola's ABC Festaretoo light but are not yet capable of reading fluently.Thisapplication is suitable for both pre-school andfirst-classclasses. It can be used in groups or alone. Children canuse theapp alone by starting at the simple level. As a child learnsandsolves multiple tasks, the app will automatically switch tomoredifficult levels. Alternatively, a teacher or parent can chooseanappropriate level for the game to stay on. Learn to Read WithLolais professionally designed and assisted by user data from tensofmillions of children who are already enjoying Lola Pandalearningapplications worldwide. We have strived to make theapplication sofun that children want to learn, even if you don'teven encourageit. More about high quality Lola Panda learningapplications can befound here: www.lolapanda.com Enjoy the learningadventure withLola's rhyming words! Rautatienkatu 21 B 33100 Tampere Finland. Lola’s Learning World is a comprehensive math game with dozens oftasks for hundreds of hours of child-friendly educational fun withLola Panda. The tasks are developed with top educators to helpimprove school readiness for children ages 3-5. Correct answersearn more challenging tasks.Lola's World is a recipient of theprestigious Mom’s Choice Award.LEARN: - Measurement: Size, amountand number comparisons. - Patterns & Sorting: Match groups andamounts. Compare objects.- Counting & Numbers: Numberrecognition. Count objects and numbers. - Basic Operations:Addition with numbers and objects. Number sequencing. - Geometry& Colors: Recognize shapes and colors.Kids choose theirfavorite avatar and hop on the air ship to travel around the world!Educational math tasks teach fundamental skills, while other funcontent and in-game rewards provide even more entertainment for theyoung adventurer.There is no need to choose what level to play. Thegame automatically adjusts the difficulty level and rotates tasksin a logical way – starting from the easiest tasks and moving on todifferent or more challenging activities as the child gets theanswers correct.“I love the app for what it does and the skillsthat it enforces. Sweet B loves the app because it’s easy for herto use.” - www.justanothermom.net“The app has so much to offer kidsand is very entertaining for them. Best of all they are learningwhile having fun. Win-win!” - www.casamoncada.comFREE GAME:Get toknow the game with the first 10 math tasks (easiest content).GETTHE FULL VERSIONThis will open the full range of Lola’s Worldfeatures and learning activities. Includes the entire curriculumwith 102 engaging math tasks at all difficulty levels, to help getyour child school-ready and math-confident. Kids love the choice ofall seven avatars and all the fancy clothing items, fun accessoriesand toys, tasty in-game treats and 15 drawings to color. Thisone-time purchase gives you access to all the content for anunlimited time.Learning fun with Lola for the best math adventureever!